The Stuttgart Region comprises the region’s capital as well as the 178 surrounding local authorities in five districts. The extensive range of cultural and educational offerings, the landscape characterised by vineyards and orchard meadows and the diverse range of leisure activities on offer make for an attractive life after work in the evenings. This colourful and diverse region also benefits from people from roughly 180 countries around the world who have made the region their home. The Stuttgart Region is one of Europe’s strongest economic locations as well as a leading high-tech location with a first-class research infrastructure. Its special strengths lie in the fields of automobile construction and mechanical engineering, in the creative sector and in IT with a focus on industry-related services. 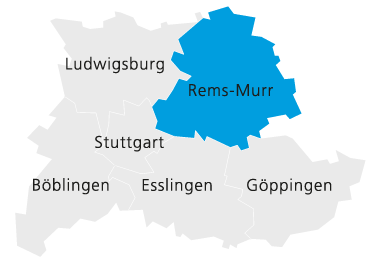 We have put together information that is relevant for you if you want to work and live in the Stuttgart Region. 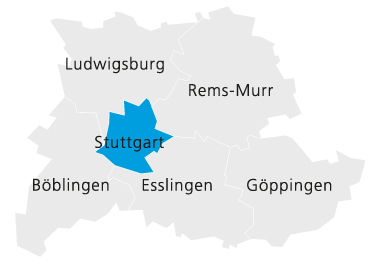 If you do not find what you are looking for, the Stuttgart Welcome Center will be happy to help you over the phone, by e-mail or from the autumn of 2014 in person. The Stuttgart Welcome Center is a central point of contact of Wirtschaftsförderung Region Stuttgart GmbH for Fachkräfteallianz Region Stuttgart (Stuttgart Region Skilled Specialists Alliance) and of Stuttgart as the state capital. 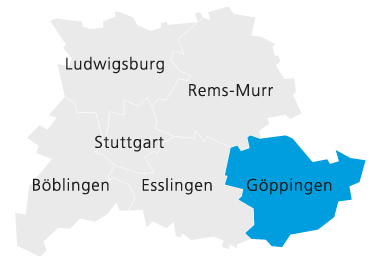 Type in the city or town and click on "select"